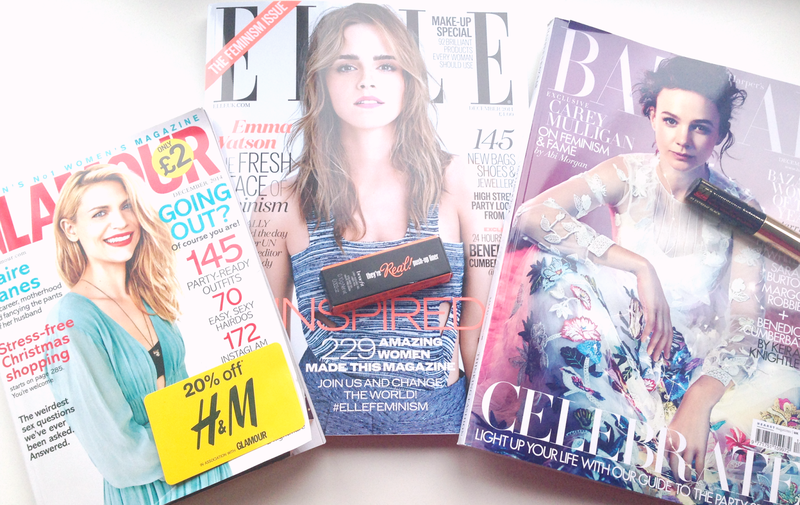 This month there are lots of fantastic freebies with UK magazines. The current issues are dated December 2014 and are available throughout November. Glamour,£2.00 - The December Issue of Glamour magazine comes with a 20% off H&M giftcard valid throughout November and a full size Nails Inc nail polish (worth £11) in a choice of 4 Autumnal shades - Tate,Hanover Square,Marylebone Mews and Wigmore Street. Unfortunately I am unable to show you any of the nail polishes as I am a Glamour subscriber I have to visit a Nails Inc counter to pick up my freebie. Elle,£4.00 - The latest Elle magazine comes with a free sample size Benefit They're Real Push-Up Liner, I've been wanting to try out this liner so this was the perfect opportunity to do so. Also how beautiful does Emma Watson look on the cover?! Harper's Bazaar,£4.50 - The latest issue of Harper's Bazaar comes with a sample size Estee Lauder Sumptuous Extreme Mascara (worth around £7). Tatler,£4.30 - The December issue comes with a 50ml sample size Cowshed handcream (worth £8.00). Will you be picking up any of these magazines this month?